In working with adults on the autism spectrum over the years, I have noticed a prominent theme that I will refer to as AMGS, which stands for Anxiety - Meltdown - Guilt - Self-punishment. This is a cycle that many adults with Asperger's [or high functioning autism] have experienced since childhood. 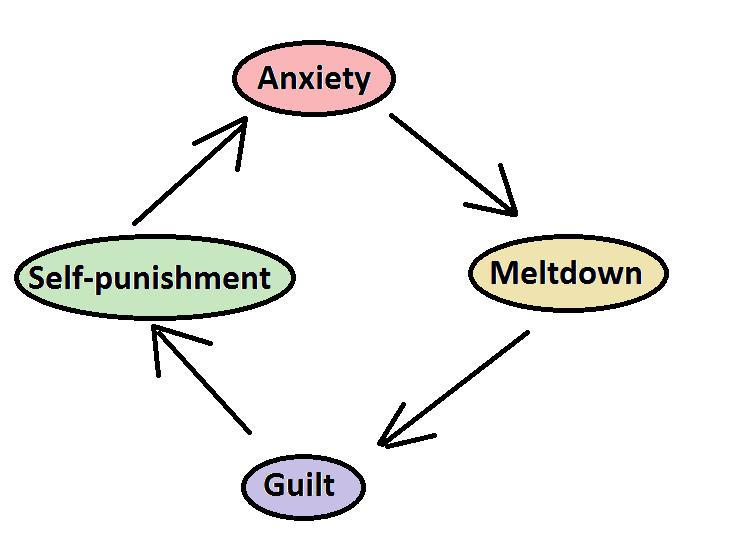 In a nutshell, the cycle starts with anxiety, which in turn leads to a meltdown, which then leads to the individual feeling guilty for acting-out his or her anxiety in the form of anger and/or rage, and ends up with the person punishing himself or herself due to repeated relationship failures that result from this destructive cycle. Unfortunately, it is very common for adults with Asperger’s to experience more than their fair share of stress – and to make matters worse – many of these people also lack the ability to manage their stress effectively. Individuals with Asperger's are particularly prone to anxiety disorders as a consequence of the social demands made upon them. Any social contact can generate anxiety as to how to start, maintain, and end the activity or conversation. Changes to daily routine can exacerbate the anxiety, as can certain sensory experiences. Many of my clients have reported feeling anxious for no apparent reason at all. Some of these individuals tend to take life too seriously, take others' behavior and comments to personally, and generally consider themselves to be “worrywarts” (i.e., chronically worrying that something bad will happen, or something good won't happen). As this anxiety, whatever its cause, builds up and builds up, eventually the dam breaks so to speak, usually over something very small. It's the straw that breaks the camel's back. This is called a meltdown. Under severe enough stress, any normally calm and collected individual may become “out-of-control” – even to the point of violence. But Asperger's individuals experience repeated meltdowns in which tension mounts until there is an explosive release. The meltdown is not always directed at others. Asperger's adults who experience meltdowns are also at significantly increased risk of harming themselves, either with intentional injuries or suicide attempts. Those who are also addicted to drugs or alcohol have a greatest risk of harming themselves. Asperger's adults who experience meltdowns are often perceived by others as “always being angry.” Other complications may include job loss, school suspension, divorce, auto accidents, and even incarceration. Rage may be a common reaction experienced when coming to terms with problems in employment, relationships, friendships and other areas in life affected by autism spectrum disorders. There is often an “on-off” quality to this rage, where the person may be calm minutes later after a meltdown, while people around are stunned and may feel hurt. Neurotypical spouses (i.e., people not on the autism spectrum) often struggle to understand these meltdowns, with resentment and bitterness often building up over time. In some cases, the Asperger's individual may not acknowledge he has trouble with rage, and will blame others for provoking him. This can create a lot of conflict in a marriage. The Asperger’s individual has had a rough day at work, but was able to maintain his composure for the most part. But, when he arrives home, his wife makes a comment that hits him wrong for some reason, and he explodes. In other words, he takes his stressful day out on his wife, unintentionally! If this particular scenario plays itself out numerous times over the months or years, the Asperger's individual may come to believe that he is a victim of his emotions -- in this case, work-related stress expressed in the form of misplaced anger toward his wife and other family members. But, not only does he feel like a victim of circumstances, he also feels an element of guilt and remorse for hurting the people that he loves. He may have tried numerous times to avoid repeating this scenario, but to no avail, because he still has work-related stress, and has not figured out a way to deal with this stress in a functional, non-destructive way. 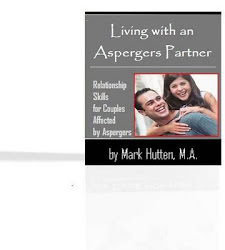 As a result of repeated social failures (in our example, numerous negative encounters with his wife), the Asperger's individual may come to the conclusion that he doesn't deserve love, compassion, or a peaceful lifestyle. Thus, he may do destructive things to punish himself. For example, beating up on himself with negative self-talk, drinking or drug use, overeating, isolation, and possibly even separation or divorce. The use of self-punishment to reduce feelings of guilt has been well documented in many studies. Guilt is suppose to be a "pro-social emotion," (i.e., functions to preserve important relationships). But, many Asperger's individuals who experience repeated exposure to the AMGS cycle have "unresolved guilt," which prevents them from enjoying life and thriving emotionally. Self-punishment tends to serve a dual purpose: (1) it relieves internal feelings of guilt, and (2) it impacts how others perceive us. By engaging in self-punishment or costly apologies, the Asperger's individual demonstrates that he is willing to harm himself in some way to “even the score” with those he has wronged, thereby restoring his reputation as a "fair person." And now we go full circle. The AMGS cycle can feel like being stuck in a perpetual nightmare if it continues long enough. Months – or even years – of experiencing a plethora of negative emotions (e.g., stress, frustration, anger, rage, guilt, etc.) can make relationships so problematic that the better option becomes living alone and avoiding human contact as much as possible. But, unfortunately, ALL of us are social creatures by nature. Thus, living a life of solitude carries its own element of anxiety. People need other people. • Anonymous said… I thought it was part of my Aspergers that I never feel guilt for anything, no matter how badly I behave. • Anonymous said… Meltdowns and guilt, I always seem to blame myself. I always say it must be great being other people because it is never their fault. • Anonymous said… So true! This is the best explanation I've seen yet. • Anonymous said… tell me about it! Especially when the meltdown's to do with sexual needs and horrid NT women getting the man you'd die for. • Anonymous said… This is definitely my son, how do we break the cycle though? • Anonymous said… This is so my daughter. How do we help them?? • Anonymous said… VERY true!!!!!! • Anonymous said… Yes I live alone as much as anyone can with 7 dogs and 2 cats and I love it. At 60 I realise that just because they tell you you should be social, doesn't mean its true. Soon as other folks enter the scenario, the chaos starts. • Does anyone have any resources to share in how to break this cycle or give the person tools to self regulate? This is a great break-down of the how/why this cycle repeats. Is there a follow-up or another article that deals more with helping break this cycle (for the individual with Aspergers or those that love them)? Great article, as understanding is half the battle. Does anyone know who to brake this cycle? My 12 year is showing these symptoms and we are trying to tech him cope skills but is there a way to stop the cycle (rather then try to prevent it). Have him write affirmations... and seriously consider speaking to an expert (and by expert I mean a child/adolescent psychiatrist who does talk therapy) about what you can model for him, what he can do, and maybe see if he has OCD as well. 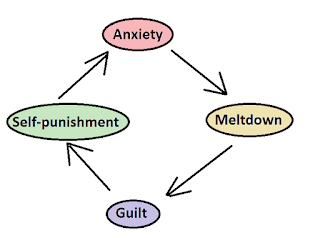 A part of this cycle, the anxiety and guilt, can be obsessive thoughts. Maybe a psychiatrist could help with that. I had broken the cycle for a decade. One meltdown in 10 years and now I feel the cycle emerging again. My best friend thought HFA was all me just being absent minded and quirky. Now they are afraid and don't want to be friends. This hurts just as much as an adult as it did as child. I wasn't violent in my meltdown. Just shaking, crying and some yelling out, but not accusative at them specifically. Just makes me feel sad and awful.